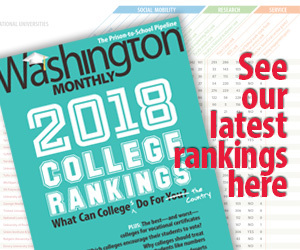 Washington Monthly | Financial Stress Tests for Small Colleges? The Massachusetts Board of Higher Education meets Tuesday to discuss the future of students at Mount Ida College, the liberal arts college in Newton set to close at the end of the month. Many of its 1,500 students—and incoming ones who had planned to enroll this fall—are unsure where they will complete their degrees. One thing is sure: more difficult days are ahead for small private colleges. Education officials are debating whether to help students and their parents identify colleges that are in financial trouble. In testimony before the board last week, one by one Mount Ida students and their parents blamed administrators for the school’s sudden closure. “Someone needs to be held accountable and do what’s right for these students,” said Becky Bridges, whose daughter is enrolled in Mount Ida’s veterinary tech program. Her daughter is scrambling to find a school that will accept her credits. Bridges and many others feel betrayed. “Our children were given scholarships and a commitment from the school,” Bridges said. At this point, there is little the state can do about the broken promises made to Mount Ida students, but higher education leaders are proposing the state step in before another small college collapses like Mount Ida did. “These trustees waited until the absolute last minute and basically went bankrupt and left their students out on a limb,” said Paul Reville, a former state education secretary who now teaches at Harvard’s Graduate School of Education. Moving forward, Reville says the state should run regular stress tests on small colleges as federal regulators do on big banks. The idea is to monitor the colleges’ debt, deficits, enrollment and tuition discounts. With schools facing rising costs and a shrinking number of high school graduates, economists have warned that more colleges will close or merge. A survey out this week by the National Association of College and University Business Officers finds many private colleges are at risk of using more than half the revenue from tuition and fees they get from freshman to fund scholarships and grants that attract students. After hearing hours of emotional testimony, Chris Gabrieli, chair of the higher education board, said the state should work with colleges to prevent another sudden closure and to restore public confidence. Getting the cooperation of private colleges could prove difficult. College leaders say no one stress test fits all. Barbara Brittingham of the New England Association of Schools and Colleges said the regional accrediting body looked at Mount Ida’s books earlier this spring when it was in merger talks with another small school in Newton. “We believed that they would be working out an arrangement with Lasell College,” Brittingham said. Many colleges worry if the public knew about their financial challenges, their demise would become a self-fulfilling prophecy. “When an institution is financially fragile, we ought to be watching it, the accreditor should be watching it, arguably the state ought to be watching it, but we ought to do it in a way that doesn’t overly burden the institution, which is already working very hard to make things work,” Brittingham said. For Lisa McClean, any of that work is too little, too late. McClean, whose daughter intended to enroll at Mount Ida’s class of 2022, said President Barry Brown told parents the college failed because it offered tuition discounts it couldn’t afford. On Tuesday, the board plans to discuss what more the state can do to prevent another Mount Ida.